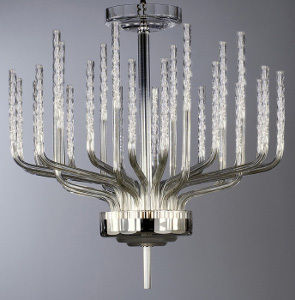 Conptemporary Chandeliers can be the perfect accessory for that modern house! Chandeliers are well recognised as items of beauty and distinction and can be found in a whole host of distinguished buildings. Traditional chandeliers will take the prime position in high class hotels or add splendor to a museum or art gallery, but we do not all have properties like these to ornament with a fabulous classic design chandelier!! Invariably properties these days are far more modern and with the increasing number or properties being built then the percentage of Victorian or Georgian buildings, with fabulous ornate ceilings which are crying out for traditional chandeliers, will naturally decrease. So if you still want a crystal centrepiece to complement your modern home then what do you do? Now you might say that the above contemporary is just not radical enough for these modern time. 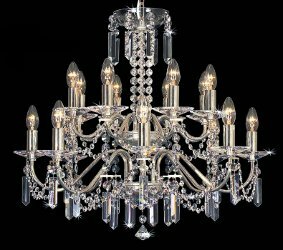 You do not want a traditional chandelier that has simply bee upgrades to modern styles, albeit in a very tasteful manner, you want a radical new contemporary chandelier design with original looks that will sit nicely along side that very modern property and designer furnishing. The example here is one of the most up to date contemporary chandeliers with striking angular proportions with crystal blades that shoot out from the central sconce then change direction and point to the sky. These blades are beautifully made from fine crystal and are illuminated by LED light technology. The LED technology means that LED bulbs will typically use only 10% of the electricity of traditional filament candle light bulbs. This means that not only do you have a fine example of modern design but these contemporary chandeliers are eco friendly and you can play your part in contributing to a greener environment. So in this modern age of contemporary design and eco living then this contemporary chandelier is certainly worth a second look!